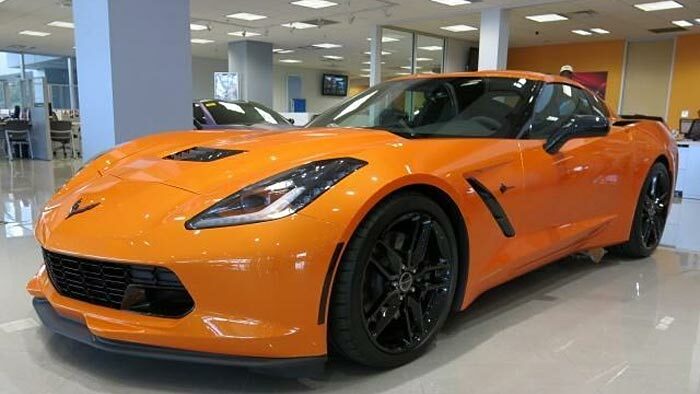 If you were to visit the Stingray Chevrolet dealership (yes, that’s the real name) down in Florida, you would see some vividly colored C7 Corvettes in hues not offered from the factory. Such as the 2015 Corvette Z06 pictured above in a wrap very similar to Synergy Green seen in some limited-production Camaros. Or the mango-tastic Stingray (with a Z06 grille insert) just below. Both photos were found on Corvette Forum. We suppose it’s fitting that such tropical color offerings come from a dealership in the Florida tropics. But it’s also gotten us thinking: should Chevrolet offer this bright green amongst the other 10 colors currently available for the Corvette? We’ve asked similar questions before, but actually seeing photos of vibrant ‘Vettes only makes the debate carry on into the Gulf of Mexico sunset. So fill out our latest poll, and give us your thoughts in the comment section below. The C7 Corvette has the Lamborghini affect: people want bright colors. Lime rock green was a bad seller, as a result it’s gone. But if they offered this synergy green, it would be a hot seller. People want to be seen in these cars and the design of the C7 is complemented nicely by these colors. Would love to see Candy Apple Red. They already charge extra for certain colors so why not offer knockout color to the customers who want them.